Take your passion for scuba diving to a whole new level! Love scuba diving? Want to share it with others? Become a PADI Divemaster in Bali! The PADI Divemaster course will take your diving to a whole new level and allow you to do what you love as a career. Scuba divers look up to PADI Divemasters because they are leaders who mentor and motivate others. As a PADI Divemaster, you not only get to dive a lot but also experience the joy of seeing others have as much fun diving as you do. 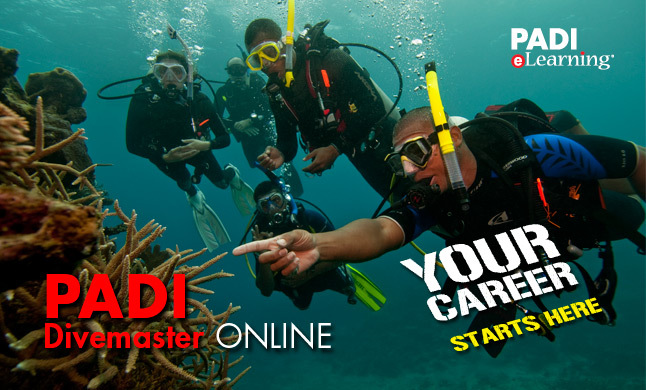 The Diving Indo PADI Divemaster course is your first level of professional training. Working closely with our highly experienced PADI Instructors, you’ll fine-tune your dive skills, like perfecting the effortless hover, and refine your rescue skills so you can anticipate and easily solve common problems. You’ll gain dive knowledge, as well as management and supervision abilities so you can become a role model for divers everywhere. As a PADI Divemaster in Bali, you’ll lead others as you supervise scuba diving activities and assist with diver training. Enjoy learning how to map dive sites, do emergency planning, and see how a PADI dive shop runs. The Diving Indo PADI Divemaster Course runs over 30 days, allowing you the time to enjoy some excellent fun diving at some of Bali’s awesome dive sites. Why Bali for your PADI Divemaster Course? Bali has some amazing dive sites from a world-famous wreck at Tulamben, resident Mantas at Nusa Penida and incredible macro diving at Seraya and Amed, Bali has it all! As a PADI Divemaster trainee, you are coming to a new country which is safe and friendly, rich with culture and abundant with beautiful scenery. It is also a modern island with internet, restaurants and cafes, easy and cheap transport, and if you aren’t looking for your own accommodation, then you can stay at our on-site guest house and restaurant with A/C, hot water, and inclusive breakfast and pool. Bali really is the Island of the Gods! If you wish to complete the PADI Divemaster theory online before you arrive, click on this link to start now!